I have been so high on poly fumes busy working on things around the house that I haven't acknowledged some wonderful awards bestowed upon me by my fellow bloggers. Without further ado, I want to thank these ladies for mentioning my little blog as one of their favorites! 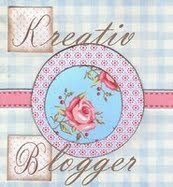 Early this month, I got the Kreativ Blogger award from my DIY soul-sister, Meg at House Notes. Then, I got the Sunshine award from my almost-neighbor Kristi at Life at the Chateau Whitman. 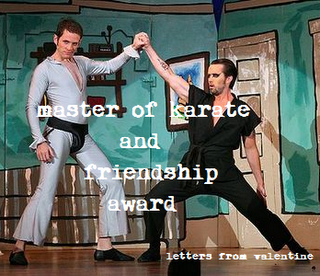 Then, I got the incredibly funny 'Master of Karate and Friendship' Award from one of my newer blog reads, Nellie at McCarthy Designs. I also realized a few days ago that I never put out a post when the lovely Jessica from Lavender and Lilies featured me on her site.....waaaay back in February! Please check out that post here and also check out the rest of Jessica's blog, she is a fashionable girl, from her home to her clothing style. Thanks again for the feature, Jessica! And thank you so much to the other bloggers for thinking of me! Thanks for the inspiration, and please consider this a 'triple-award' from me! ps - I just noticed that Brittney at Our Poverty with a View gave me a little blog love earlier this month. Good thing she was already on my go-to list! Hi - thanks for the shout out! Thanks so much for the shout out--such a nice thing to wake up to! Congrats and you are very welcome! Talk about multi-faceted! Your versatility astounds me. A kreativ, sunshiny karate master? Sounds like a winning combo to me!I'll have to check out some of these blogs that I haven't visited before! Aww, thanks so much for the shout out! Can't wait to see those "after" pics of your floors!! Thanks for the shout out Sarah - appreciate it. Always love coming by here to read about your projects and all of your wonderful tips for DIY projects :) Always an inspiration!! Aww, thanks for the award! I'm always humbled that people actually enjoy reading my little ole blog! You started my morning off on a bright note. Have a great day!